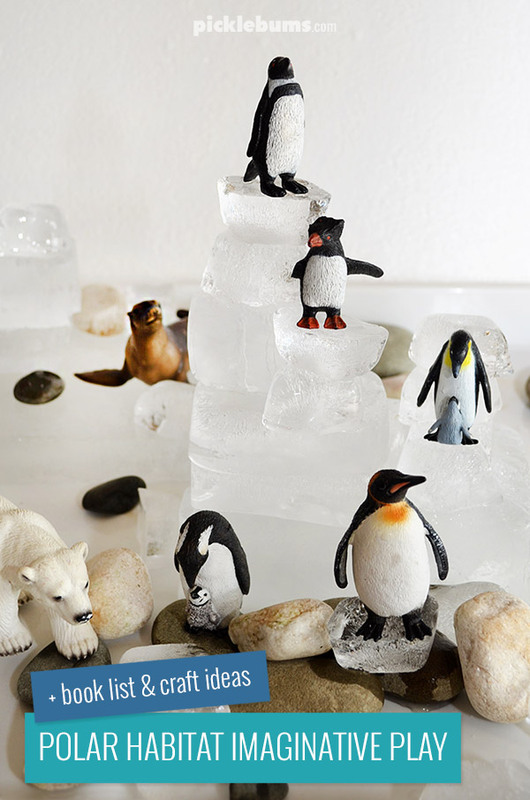 Polar Habitat Imaginative Play - Plus Book list and Craft ideas. 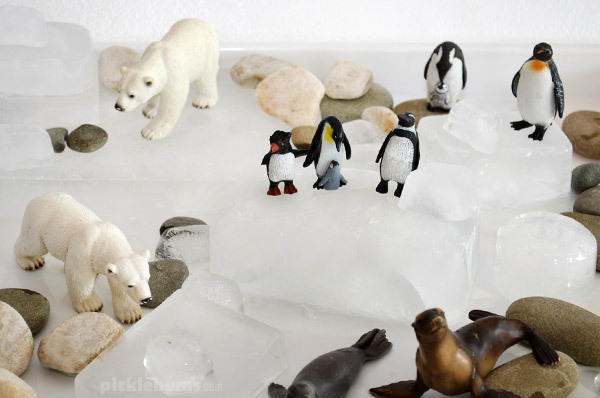 Polar Habitat Imaginative Play – Plus Book list and Craft ideas. I wasn’t sure where my son’s sudden interest in polar habitats had come from, and I wasn’t sure about my answers to all of his questions either! 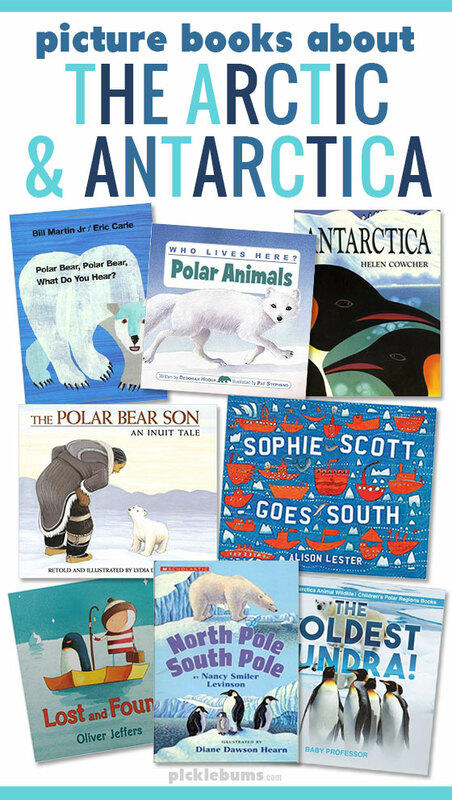 But with a bit of help from google and some lovely library books my son’s interest in polar habitats just grew and grew. So on the weekend we set up some polar habitat imaginative play! The Artic and Antartic are such mysterious magical places, it’s no wonder kids are interested in them. 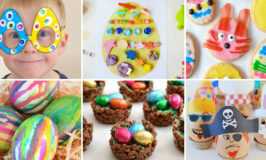 They also present so many opportunities for kids to explore and learn new concepts. 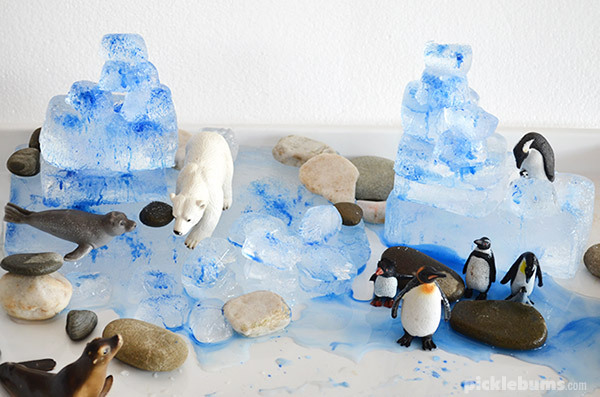 This polar habitat imaginative play activity takes a little pre-planning, but it’s easy to set up, and lots of fun to play with. And it’s a fun way to reinforce some of the interesting facts we learned about the Arctic and the Antarctic. We set up our polar habitat imaginative play on a large shallow play tray, on a low table. You could also use a shallow tub, or set it up outside on a towel where it is ok to get a bit drippy and messy. The day before we wanted to play, we filled lots of different containers with water, and three ice block trays. We used containers of various shapes and sizes, a large flat container, lots of rectangular containers, and even some tubes. We froze them all overnight so we would have lots of different sized and shaped pieces of ice to include in our polar habitat. Here are some other things we included in our polar habitat imaginative play set up. Some water colour paints – optional. Even though we learned that penguins do not live in the Arctic, and Polar bears do not live in Antarctica, so polar bears do not eat penguins, we chose to bend the rules and include both of them in our polar habitat! That encouraged some interesting conversations about whether polar bears would eat penguins if the did live together! Sprinkling a little salt on the pieces of ice can help them stick together. The salt made it easier to make some very cool, carefully balanced, ice towers for our animals to live on! It also makes the ice melt in interesting ways and adds even more ‘white sparkle’ to your polar habitat. We started out with just the plain ice, making homes for our animals and exploring how to ice felt and how it melted. After a while I bought out a set of watercolour paints in shades of blue and grey to pain the ice. Painting on ice is such a cool (excuse the pun) activity and it added a whole new dimension to our polar habitat imaginative play. Watching the colours drip down the ice, mixing and swirling as the ice melted is super cool and definitely worth trying! The Arctic and Antarctica are both such cool and interesting places, and there are so many interesting polar animals and things to learn. 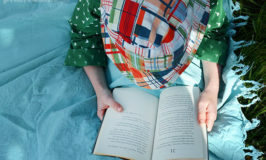 There so many lovely children’s books on the subject, but fiction and non-fiction, here are a few of our favourites. 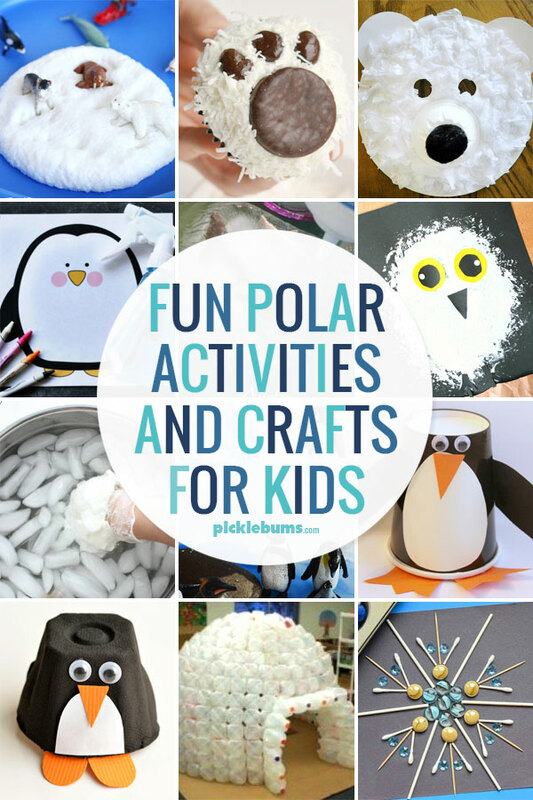 If your kids are like mine and still can’t get enough of the North and South poles, here are a few more Polar ideas and activities to try. Make some polar bear paw cupcakes. Make a polar bear mask. 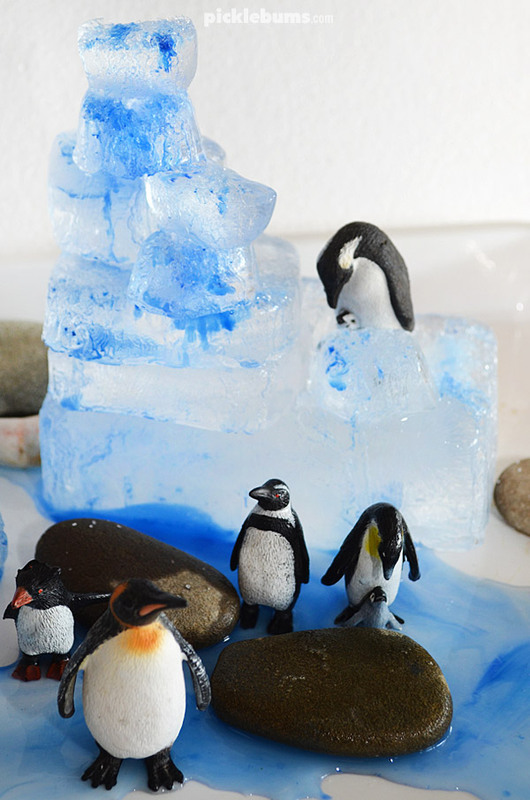 Try this science experiment – how do penguins stay dry? This artic animal rescue is another fun ice activity. Find out how arctic animals stay warm with this simple experiment. Play this penguin roll and make game. Make an adorable egg carton penguin. Make a milk jug igloo. Build some snowflakes with loose parts. And this is a great little video explaining the difference between the Arctic and the Antarctic and that whole pesky penguin vs polar bears question. You can find more awesome, kid-friendly videos about the Arctic here, and some about Antarctica here. I think that just about covers everything you’ll ever need if your kids are interested in polar habitats! If you got some more great Arctic or Antarctic activities or ideas we’d love to hear about them. Leave a comment or a link below. 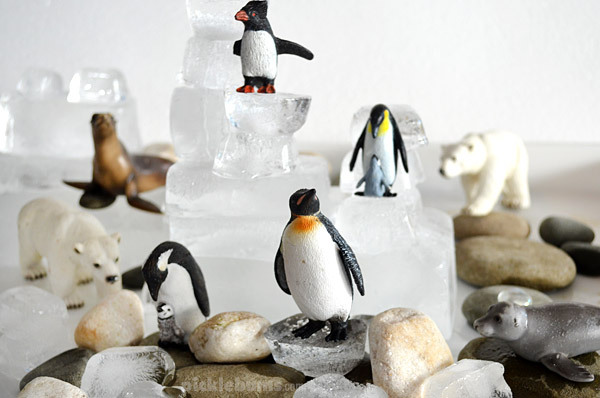 Home » Polar Habitat Imaginative Play – Plus Book list and Craft ideas.